In order to have the type of life that we would like, it is important to make good choices about who and what surrounds us. One of the ways we can do this is to evaluate our circumstances and who we spend our time with. But sometimes we can take this too far. We move from deciding if something is the right fit for us, to saying something is inherently bad. We decide it is unworthy of our time and attention. When I judge someone or their beliefs harshly, it is often because I am fearful. On some level I am worried that their beliefs or actions will undermine me. 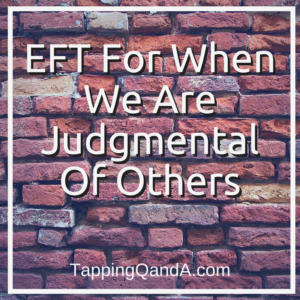 This week I have a tap-along and script for those times when we become too judgy and critical of those around us. The full tapping script can be found below the player. I recognize the fact there are times when I am very judgmental…There are times in which I am very harsh…Where I put other people down and think that they are not good enough…I am really embarrassed by the fact that I do this from time to time…It’s not who I want to be…It’s not how I want to treat others…When I act this way I feel a great sense of shame…I feel a great sense of disappointment…I am embarrassed…I recognize the fact when I act in this way it’s because I feel hurt…Or I feel attacked…Or I feel like I’m in danger…That is why I lash out…That’s why there’s a part of me trying to push someone else down…So I can feel safe…So I can feel secure…I give myself permission to be easy with myself…I must take responsibility for my thoughts, actions, and emotions…I can be gentle with myself when I make bad choices…Part of me feels ashamed…There is the part that knows that I can be better…The part that knows I was made for better…I give myself permission to be easy with myself…I encourage myself to strive to be all that I can be…To see the true worth of others…Without feeling insecure…To feel safety without feeling like I have to push someone else down…I know I can judge less…I want to be less judgmental…I give myself permission to love myself enough to know I no longer need to put others down…I commit to letting go of judging others. OH MY, did I ever need this right now in my life! Thank you Gene!! Thanks for putting it all out on the table, Gene. For including these moments, which we all probably have too, but are hard to admit and talk about. Yes, I find myself doing this a lot at the type of event you described. Would like to see you do a script on being judgmental that includes “how I got that way.” Meaning that others judged me so I judge back, or I judge too (the bad version of “pass it on”); or I watched as family members judged others and then thought that’s how you were suppose to be. As always, your podcasts and scripts are SO helpful. Thanks, Gene!